You Are Fired. Your so called safe Job is gone. Your home got hijacked by the bank for unpaid loan down to last sliver fork and spoon. Your wife and children dump you for obvious reason. The only choice left is to moved on with your life. 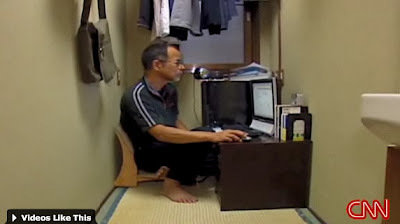 A middle-aged man shown above struggling to find a job online and now live on cramp room with mini internet enabled pc that cost about 1,500 yen (*Rm 50*) rent per day . The hard reality of life. Sigh! i know it's sad to see that picture and to realise the feeling of why working everyday just to pay off the rent and food. i felt that recently when i was kinda in debt. the feeling is sickening and i cannot imagine those people in africa feeling this way all their life.